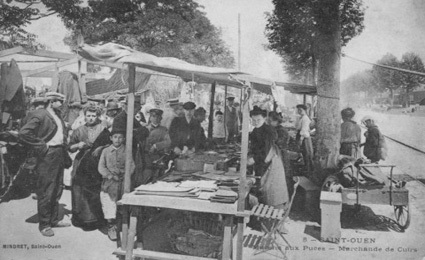 Our Paris Flea Market, actually located in the town of Saint-Ouen, also sometimes also called ‘puces de Clignancourt,’ originates back in the days when there was no garbage collecting in the city – a tradition that goes back, they say, to the Middle Ages. 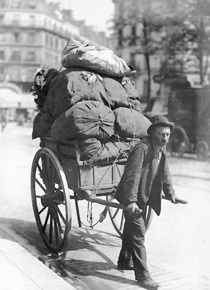 Ragmen would scoure through garbage, picking through junk for objects they hoped to sell. 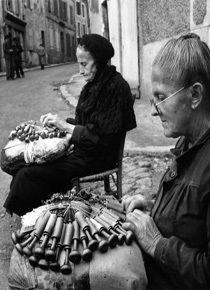 The ragmen were called crocheteurs, ‘hook men’, for they used hooks (‘crochets’). Textile was very sought after – easy to recycle, and highly valuable. 150 years ago, ‘crocheteurs’ were expelled from Paris on health grounds. They set up ‘shop’ right outside the city’s military walls, on the bare land where it was illegal to build constructions. Soon enough, tales of fabulous bargains (and fire arms on sale) made the market popular. Upon seeing piles of junk as far as they eye could see, one disgusted visitor called what he saw ‘nothing but a flea market’. Someone was listening, the phrase caught on, and today “flea market” is standard in so many languages – all after the Paris model. The first permanent cabins were built after the First World War, by one Monsieur Vernaison, a ‘chaisier’ who rented chairs by the hour in public gardens in Paris as his main occupation. Crocheteurs were no longer obligated to move their goods to storage every night. The market he created is now called marché Vernaison. 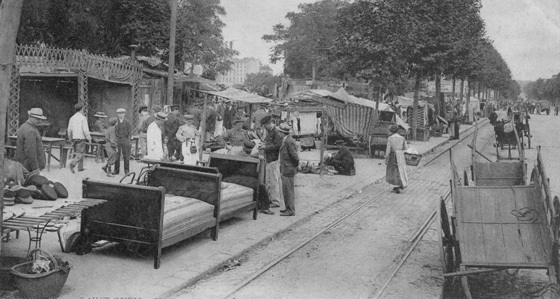 Today the city of Paris boasts many as 3 separate flea markets, thanks to endless supplies of anything from furniture to art and craft and clothes all over France. 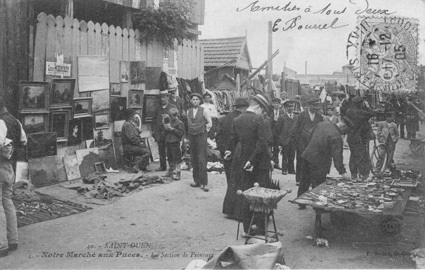 Of the three markets, ‘Saint-Ouen’ is the largest and most vibrant. 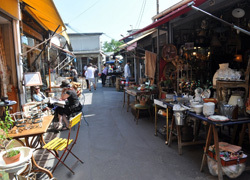 Most customers are local Parisians – ‘chiner’, or shopping through odds and ends, is a favorite pastime with Parisians. 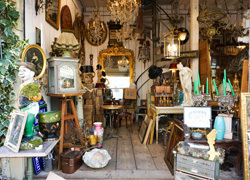 Our Paris flea market has grown to become the largest and, we claim, the most exciting, antiques market in the world.